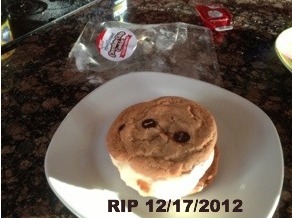 You may remember in late December when I got a harrowing picture text that my beloved chocolate chip cookie ice cream sandwich from Carl’s Jr was being helplessly devoured by Sajan while I was at work. Full story here. 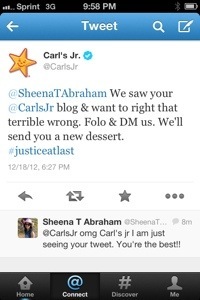 Little did I know that my dear friends at Carl’s Jr. witnessed this atrocity through the interwebs. And they cared. It’s just that I didn’t notice their tweet until 6 months later. But even time could not stop justice. Just days after I responded to their tweet, something special came in the mail. A handwritten note and gift cards to replace my old dessert! Another trip to Carl’s Jr. is in order. In all fairness to my dear husband, you can read his side of the story here. 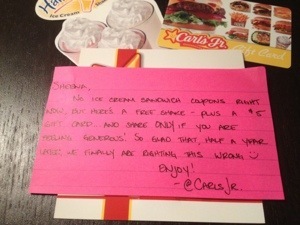 God bless you, Carl’s Jr.